That is what it probably looks like to the outsider as they observe those of us who are relentless when looking for banded/flagged birds. I love checking flocks of Gulls or Shorebirds or just any birds for tags, bands, transmitters, flags or anything indicating someone is interested in gathering data on the marked subject. Sometimes, the task could be so daunting when presented with huge numbers that one could easy abandon ship. 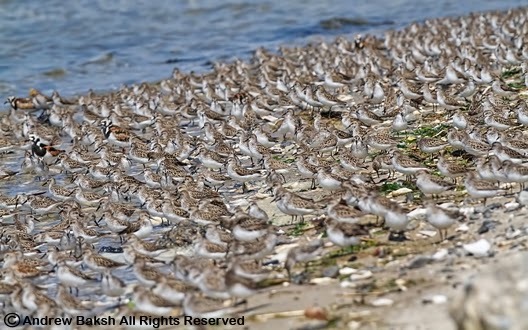 Take this flock of shorebirds for example, it is not large but you get the picture. Crazy one might say but when you find one of those flagged birds, the feeling of success trumps everything and just like that the thirst is gone, the hours of standing and scanning birds is forgotten and the goal of getting the all important documentation just becomes the focus. I think of it as contributing to the science of Ornithology in helping banders/ringers and anyone researching the movement of a given bird. Try it, you might like it but I warn you it could become an obsession...I should know. Great title for this post! I imagine it can be kind of like finding a needle in a haystack...and very satisfying when you finally do. In a group of shorebirds, how many do you usually find have been banded? Are you able to see the information on the band? If so, do you notify the bander? Thanks for sharing! Thanks Ashley, I enjoy searching through flocks of birds looking for flags or rings. It is gratifying knowing that the data will help researchers.